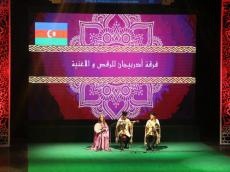 Azerbaijani culture has been successfully presented at the International Festival of Culture of Islamic Countries in Egypt. The Islamic Festival under the auspices of the Organization of Islamic Cooperation is held under the slogan "One Nation, Diversity of Cultures". The opening ceremony took place at the Cairo Opera House on February 5. Representatives of more than 20 countries attended the festival. Mugham trio of the national artist Simara Imanova and the Azerbaijan State Song and Dance Ensemble took part in the concert program. The performance of national artists was greeted with a storm of applause. Azerbaijani delegation is headed by advisor to the Minister of Culture Aydin Ismiyev. International Festival of Culture of Islamic Countries will see various cultural and artistic events, scientific seminars and much more. The festival features a number of Islamic international institutions, including the Center for History, Art and Culture, the Islamic Center for the Development of Trade, the Islamic Foundation for Solidarity, as well as the Islamic Organization for Education, Science and Culture, etc. The event will last until February 9.